A dozen Ducati motorcycles, an angry baby head sculpture and gallery attendees riding around on Onewheels in an old warehouse seem strange. But all of this was found on the way to the R. Blitzer Gallery, where the second half of the art show “In Conversation” premiered on April 8. 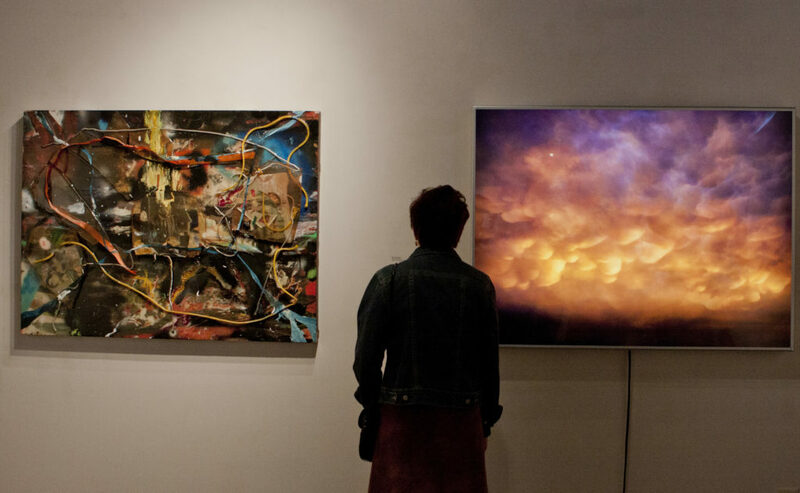 The first half opened at the Sesnon Gallery in Porter College on April 7, and together they made up the first UC Santa Cruz faculty art show in over 10 years. All around the gallery, academics in skinny jeans and cardigans discussed the works using terms like “investigations,” “reification” and “teleological.” The air buzzed with the collective scholarship in the room. 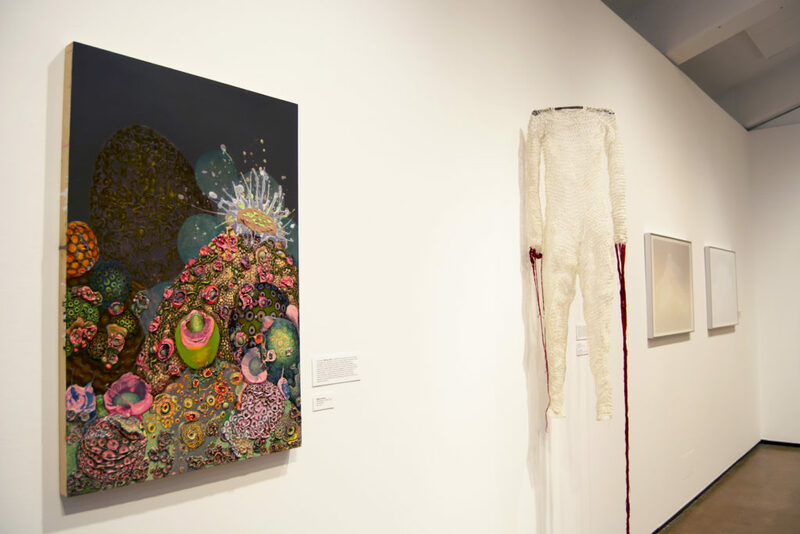 Previous faculty shows only featured tenured professors, but this time around, Sesnon Gallery curator Shelby Graham and manager Mark Shunney invited all arts division faculty members to take part in the show. Graham and Shunney had a number of works to choose from for the exhibit, including an interactive role-playing video game series by lecturer Susana Ruiz, an octopus sculpture that functions as a water fountain by instructor Sean Monaghan and deceased icons’ faces burnt into toast by lecturer Kyle Lane-McKinley. Though Graham and Shunney metaphorically arranged the art pieces “in conversation” with one another, the show is literally meant to put people in conversation with the art and the artists. Comment boxes, where patrons can leave questions for the artists, were placed in the gallery to ignite discussion. Every Wednesday evening during the shows’ run, three featured artists will lead panel discussions and answer these questions at the Sesnon Gallery. The moderators will help the public engage with artists in ways that are more personal than other art galleries. The artists want to inspire students to think critically about their pieces. 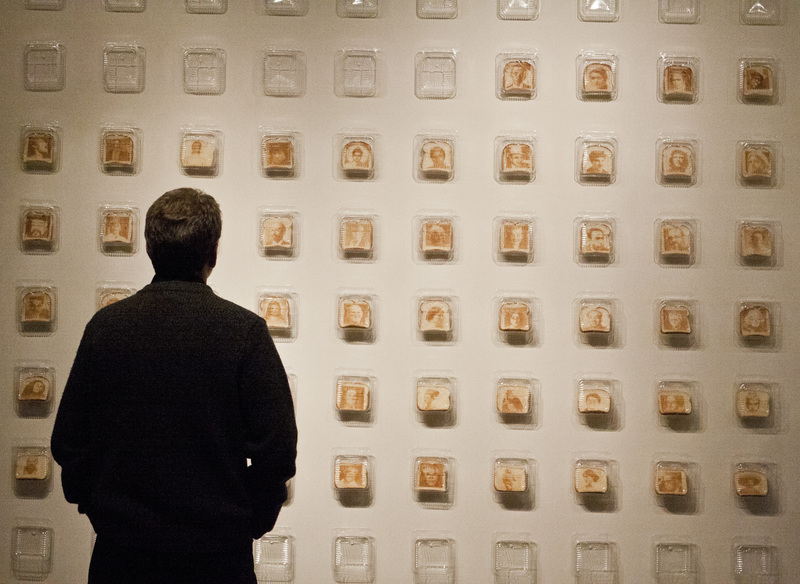 Though Lane-McKinley admits that putting faces on toast brings up more conversations about how he creates the pieces, he hopes people will instead think about why someone would put a face on toast. While Lane-McKinley’s work began by decrying university administrative actions, other art pieces focused on more national political movements. After investigating five underground oil shale formations in the U.S., newly-hired professor A. Laurie Palmer created a fabric shawl to look like maps of the shale formations, highlighting the dangers of unsustainable energy sources in the U.S.
“Part of what I’m looking to do is connect with the Keep It in the Ground movement, [which aims to promote use of renewable energy],” Palmer said of her art piece. More than showcasing faculty’s work, “In Conversation” brings the public closer to the artists, creating a greater sense of community. Sesnon Gallery intern Carrie Hoffman spoke about the importance of the show. “In Conversation” is showing until May 7 at the R. Blitzer Gallery at 2801 Mission Street Ext. and the Sesnon Gallery in Porter College. Panel discussions take place Wednesday nights at the Sesnon Gallery.